1. Take some time to make videos yourself. Personally, I spent a year shooting and editing videos before I ever attempted to teach it to kids. It's not necessarily about learning the tools, but more about learning a new medium. 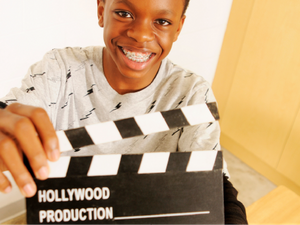 Trying to shoot video yourself will help you anticipate the challenges your students will face when making movies for classwork. 2. When designing a video project, like any good project, start with the standards. What do you want to accomplish? What do you hope your students will learn or demonstrate their understanding of? 3. The writing always comes first! Students should be writing and/or storyboarding before they shoot any video. They should very clearly know what they're going to shoot. And make sure to edit the writing. Their first attempt at scriptwriting will probably not be as good as you'd like. They'll need guidance in how to make sure they include the things they need to demonstrate their learning. 4. Embrace failure. The first videos are probably going to boring/shoddily produced. My kids learn way more about what they like and don't like in movies by watching each others' work than they ever would be just listening to me tell them what makes a good movie, but that takes time to develop. 5. Especially when starting out, if you have access to iPads/iPod Touches, shoot and edit on your device using the iMovie app. It's incredibly simple to use, and lets you immediately throw away bad footage. The trailer mode in particular is a great introduction to digital storytelling, without all of the post-production editing work. 6. Share the videos in your classroom! We love having a movie premiere where we invite students/teachers, administrators, and parents to join in. 7. Share the videos with the world. Post the videos on a classroom blog or YouTube channel. My students always love to see their view numbers rise at their channel: http://youtube.com/pineglenschool. If you have any tips for getting started with video in the classroom, please share!